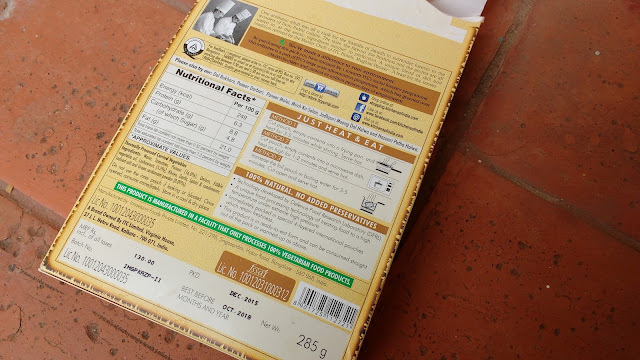 On my recent trip to wills lifestyle I spotted a counter with ready to eat meals and picked up some packets just to test them out. I picked out stuff like halwa, dal and paneers and avoided non veg because I am not very comfortable with eating packed non veg (halal or not? 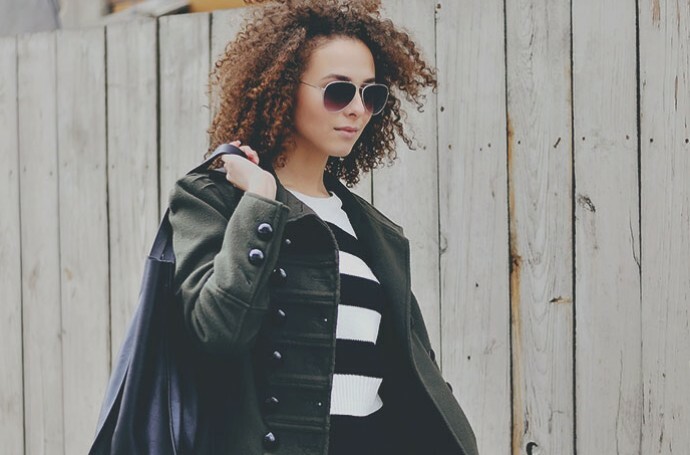 who knows!). 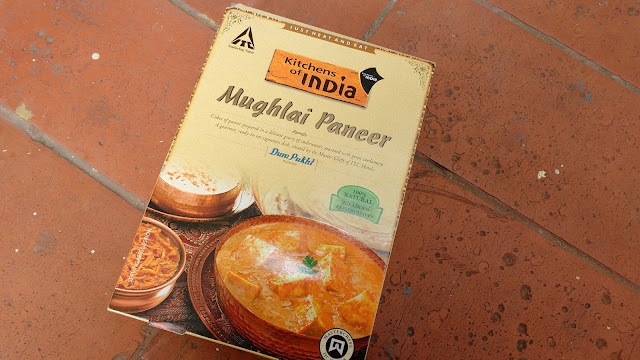 Today I will be reviewing Mughlai Paneer for you . A traditional dish of the mughals, this paneer (homemade cheese) dish is prepared together with khus-khus, ground watermelon seeds and fine onion paste, spiced with coriander leaves and cardamom powder. Just heat and eat says ITC and it is just the thing lazy women like me need. I did not feel like cooking 3 days after I shopped for this product and I put some rice in my rice cooker and heated up this mughlai paneer instead of ordering food from outside. Technically even this isnt home made food but who cares! Kitchens of India Mughlai Paneer has nice thick gravy and soft paneer cubes but I was shocked to see the amount of oil floating in the packet. I suggest you just drain out the oil before you start eating and if you are a fitness freak then the gravy is totally not for you as it is rich creamy indulgence. The quantity is good for 2 people but I feel the paneer cubes could have been increased. Now coming to the most important part - taste, total disappointment. I just did not enjoy the taste one bit. It was like eating some packaged food instead of meal and that was a total turn off. I actually had my expectations high because Kitchen of India products havent failed me before. The expiry date is pretty surprising because ITC claims this is preservative free meal but their unique food processing technology might be keeping things fresh for that long. The packaging is very good, Mughlai Paneer comes packed in a plastic foil bag which needs to be cut open. 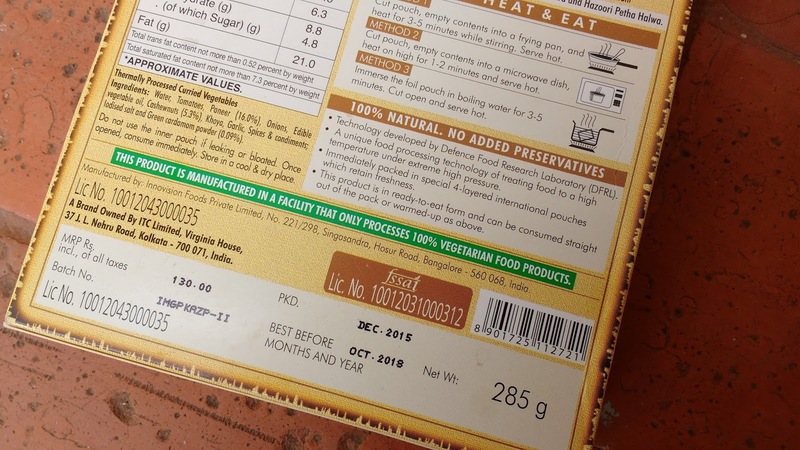 This bag is housed in a cardboard box which has detailed information about the product. I particularly love how they explained how to heat and eat in three different methods. Good job there . 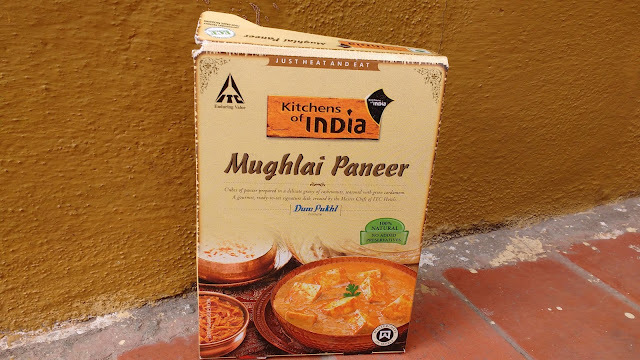 Overall very average tasting mughlai paneer which is a strict no to people on diet. you can give it one try to see if this product floats your boat but this one is total no for me.